Rubi CEV 300mm Diamond Blade (Ceramic Tiles) - ONLY £69.99 (+VAT) - SAVE £5! Rubi CPC 300mm Diamond Blade (Porcelain Tiles) - ONLY £79.99 (+VAT) - SAVE £5! Marcrist CK850 300mm Diamond Blade - All Tiles* - ONLY £119.99 - SAVE £10! 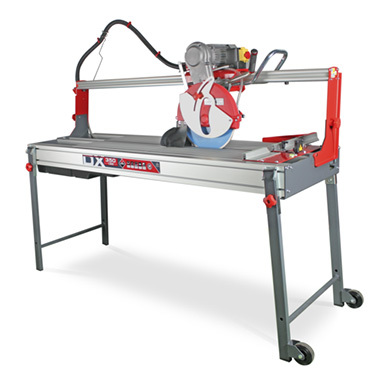 Rubi electric tile cutter with adjustable mobile head for plunge cut and total versatility. For cutting all types of ceramic tiles and building materials like: marble, granite, facade bricks, fireproof bricks and more. Motor assembly is set on sliding bearings for maximum precision and reliability. Aluminium structure is lighter and more robust. Equipped with protective safety system for segmented blades. With thermal and overload security switches. Water pump refrigeration of the blade with flow control valve. 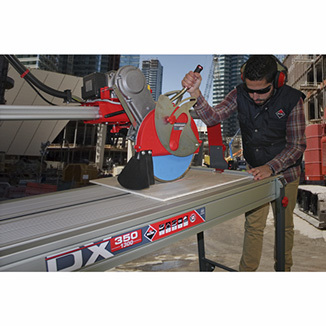 Can be used with a 350mm (14") or 300mm (12") diamond blade - NOT included. Motor on top with belt transmission. With lateral stop for repetitive cuts. Aluminium working surface - removable for easy cleaning. Circular level for easy field installation. Max diagonal cut: 105cm x 105cm tile. 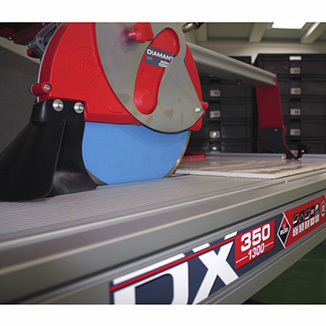 Max cutting thickness: 105mm / 220mm (dependent on blade diameter). Dimensions: 200cm x 86cm x 143cm. Includes: power cable and 2 year warranty. The breaking capacities may vary depending on the position of the head, special flanges and blade diameter.